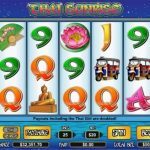 Well, we have never been to Thailand but now with the latest video slot game from NextGen Gaming we can witness the Thai Sunrise. To be honest it is not exactly what we expected it to be, but that is not important now. The design of the game tries to bring the culture closer to us and all we have left is to give this game a chance to charm us. There is not much going on in this game, but still there are a couple of symbols and features that are worth mentioning when it comes to the special features department. The Thai girl is the wild and its function is to substitute for every other symbol to complete a winning line. The only symbol it cannot substitute is the scatter which seems to be an image of a temple at dawn. There is only one special feature in this game, the free spins round. If you manage to land 3 or more scatter symbols anywhere on the reels you will activate the feature for which you will receive 15 free spins. All the wins during the feature are tripled, which is a good news and also the feature can be re-triggered if you land more scatter symbols during the round. 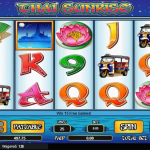 Thai Sunrise is a very interesting game from NextGen Gaming. The game play is straightforward and fast paced. 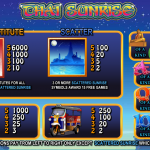 The game is quite simple as a matter of fact but still we have the free spins round which is appealing. The thing with this feature is that it is so easy to activate and the fact that the wins are tripled is good for our balance. We think you should give this game a try and make the judgment for yourself. For another great engaging game you should consider playing Teddy Bear’s Picnic a 5 reel slot by NextGen.